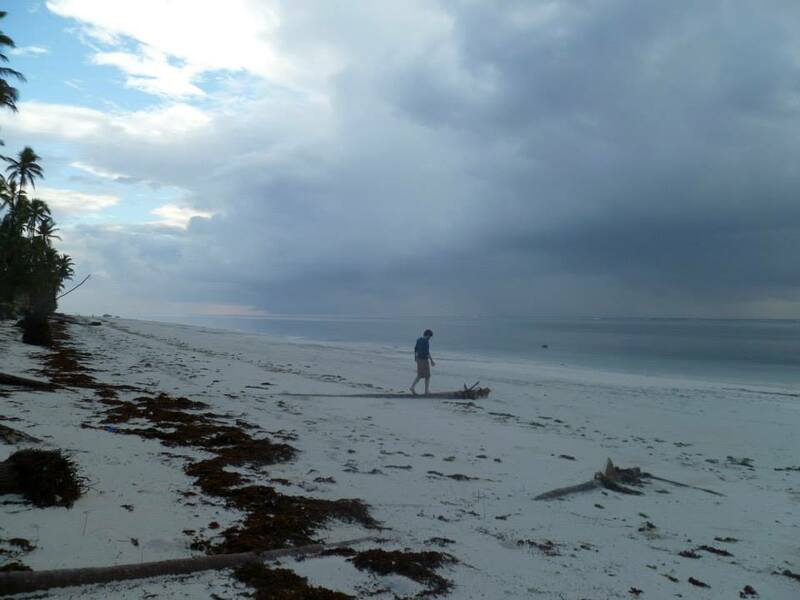 Somewhere, beyond the Sea…on Zanzibar. This is the first installment of my summer 2013 guest blogging series with the theme “Somewhere, Beyond the Sea”. Let me briefly introduce today’s blogger. John “The Wine Raconteur” was new to blogging, like me, when I stumbled on his writing. We both had started our blogs in May 2012. His was actually one of the first blogs I came across and followed. We have since interacted on numerous occasions and met in person. I consider him a friend. In his blog, The Wine Raconteur, he explores restaurants, foods and wines. For John, wine and food is about moments and memories, not scientific analyses or tasting notes. With this approach, he covers an under-appreciated side of wine and food writing. His undying curiosity and vast knowledge in wine as well as the combination of fresh and old memories keeps me coming back to his blog again and again. This post was originally published in July 2012 and revised for this series. Thank you, John! These are the opening words to the lyrics of a song that Bobby Darin immortalized years ago. Some may ask who Bobby Darin is or was, but that is not germane to this introduction or article, but it is how my brain works, in a “stream of consciousness” style of writing that I tend to do. Allow me a brief moment, to introduce myself, I am John and I am guest writing this article, as a favor to a new friend Oliver “The Winegetter” who has become an old friend, which I have met since I have started writing my own blog “The Wine Raconteur.” If the readers have not met me before, that is understandable, and they may ask, what a “Raconteur” is in so many words. Words have fascinated me, and I first learned this word, from an old board game, I played as a child, and one of the characters was called the “Raconteur” and I had to look up the word, and it means a teller of stories or tales, and I liked the word, and it has remained in my vocabulary ever since. Meanwhile, back to the lyrics, that is the theme that Oliver gave me, in his request, and I shall abide. As I pondered the words, I presumed that he would like for me to discuss a wine that is not domestic product, and that is fine, since the first wines I encountered were from overseas, which started me off on a tangent that I have never left, the enjoyment of wines. I am not as eloquent, erudite or as professorial as Oliver, so I shall write this, in my own humble style. My Bride, a sobriquet that I have endeared to my Wife, recently returned from a visit to her Sister and her family. As she was going there, I made a small request, that she photograph an empty bottle of wine from a grand Birthday party, that we had the good fortune to attend, my Sister-in-Law’s fortieth birthday. The young lady had the good fortune to have been born in 1961, which is considered by most wine authorities as being the third best vintage of the last century, especially for the wines of the Medoc. Her husband had amassed three of the great Medoc wines in anticipation of this event, and he had a small party of ten to celebrate the event. I must admit, that all of the revelers for this occasion were lovers of wine, so we all had something in common. My contribution for the event was to bring all of my decanters, and to decant the three wines that were used for three of the six courses of the dinner. Their favorite Chef was brought in, as well as his Sous-Chef, another assistant and a waiter to make the dinner as enjoyable as possible. Each course of the meal was designed to go with a particular wine, which my Brother-in-Law and the Chef pondered until they found the proper pairing for the evening. The three Medoc wines that I decanted and later enjoyed with each meal were; Chateau Mouton-Rothschild, Chateau Margaux and Chateau Latour. Chateau Margaux is from the Commune of Margaux in the Medoc, while Chateau Mouton-Rothschild and Chateau Latour are from the Commune of Pauillac. Chateau Margaux and Chateau Latour have always been First Growths of the Medoc, while at the time Chateau Mouton-Rothschild was considered the first of the Second Growths, a consideration that did not sit well with them, blaming it on the politics of the day, and they never even mentioned the classification system, until they were finally elevated to a First Growth in 1973, where most people had agreed that they belonged from day one. During the courses of dinner, every wine was wonderful and fully enjoyed by all that were there for the occasion. When we arrived at the final entrée which was Grilled Tenderloin with Green Peppercorns and a Marsala Wine Sauce, something occurred which caused everyone to be taken aback. The Chateau Latour 1961 was opened prematurely, as it was still too feisty in its youth, and this fact marveled every guest at the table, as well as the Chef. Forty year old Claret, which still needed more cellaring time to reach its full maturity, only a few wines could achieve such a testament to the skills of the winemaker. 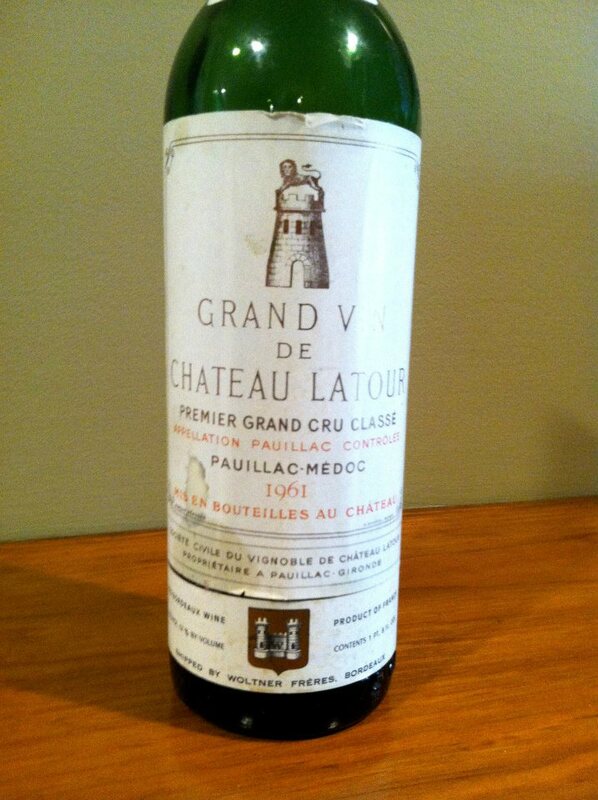 My Brother-in-Law smiled at me, and told me, that he still had one more bottle of Chateau Latour 1961 in his cellar and he would open it up for his Wife’s fiftieth birthday (and as a side note, since we were not there on that evening, he informed me that the wine had finally matured and was so mellow, that he hated to finish the bottle of wine). This long rambling story, leads me back to the beginning as to why I asked my Bride to photograph an empty wine bottle, in her Sister’s cellar. I have collected almost every label of every wine I have tried since I first started discovering wines. I have the labels from all of the wines from this great dinner and occasion, save the Chateau Latour 1961, which my Brother-in-Law wanted to maintain for sentimental reasons, and rightfully so. When I first wrote about this dinner, I had to use a different Chateau Latour label from another vintage for representation sake. I can now proudly add this wine label, albeit a photograph of it, in my own article, but I am waiting until this article is published, so as not to steal the thunder from Oliver, who is abroad with his charming wife on holidays. It appears that I missed this article when it was published. What an experience! Thanks for sharing! What a wonderful trio of Grand Crus and what a great occasion to taste them! Please enjoy your holidays with Nina, and we fellow Bloggers will try to live up to your writing ability. It was a pleasure to relive this memory from a slightly different angle.